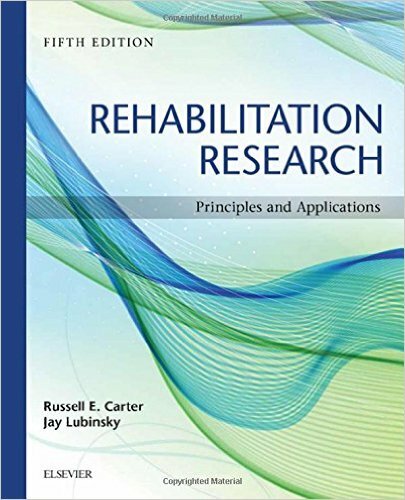 Russell E. Carter, Jay Lubinsky ‘s fifth edition of Rehabilitation Research – Principles and Applications explains the use of rehabilitation research and evidence to inform and improve clinical practice. This new edition is comprised of evidence-based content and references which makes the content more reliable and useful. The book has 28 chapters divided into 9 sections, and gives a holistic idea of research in a rehabilitation setting. Starting from ‘Research Fundamentals’ (section one) to ‘Implementing Research’ (section nine) the authors explain the content in such a way that allows the reader to get a better understanding of research regardless of their prior knowledge. The authors’ conscious effort of mentioning ‘students’ throughout the text makes the content desirable and encouraging even for a novice reader. The research fundamentals section is complete and emphasizes the importance of research in this era of evidence-based practice. The preceding sections (section two to six) shed light on the technical aspects of research which can be difficult for a novice reader. However the authors attempted to make it easier to understand by going through the content in a step-wise manner. The ‘Data Analysis’ section (section seven) gives comprehensive information about the various methods of statistical analyses. Section eight, ‘Being a Consumer of Research’, is a must-read section for any rehabilitation professional (including those working exclusively in clinical settings) as it gives an overview of clinical implications and critical appraisal of research works. The last section on ‘Implementing research’ explains how to implement a research project and publish and present research. The extensive references in the text gain the reader’s confidence and are a good resource for cross-referencing research. Suitable for students, research scholars, consumers and researchers. Uses examples familiar to rehabilitation professionals, including physical therapists, occupational therapists, and speech and language pathologists, which makes the content familiar and easy to understand. Extensive information on technical aspects of research and relatively less information on the applicability of research. No information on analysing the quality of research journals like Impact Factor, Impact Per Publication, etc. Find out how to use evidence to improve your practice! Thoroughly covering the full range of rehabilitation research with a clear, easy-to-understand approach, Rehabilitation Research – Principles and Applications, 5th Edition will help you analyze and apply research to practice.